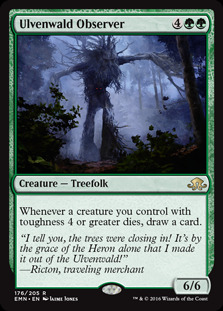 It would be interesting to see how many cards you'd draw off of Ulvenwald Observer before it dies. How do your creatures usually die board wipes, kill spells or combat? Do you think he'll stick around to draw you more than three cards? If not Combustible Gearhulk might be the worth a trial. I'd love to know how many people would give you the cards and how much damage you'd give to the people who don't. Guardian Project is probably the better choice because its harder to get rid of enchantments, you can play it in the early game and you draw a card every time you play a creature (which is alot). Hey! Retsok909 - totally love Wilderness Reclamation , saw it the other day and need to grab one. Hopefully i can pull one from a pack. Guardian Project is definitely good. I was thinking of adding in Ulvenwald Observer since it can trigger card draw as well as enter in through Mayael. I prefer Greenwarden of Murasa . Was playing it my other deck, but might make a clean switch. Love the concept! gota couple suggestions, figured I'll accordian them to keep from filling up the whole page. Predator, Flagship is costly, but lets be honest - mono-green doesn't care about that. giving flight for troops to evade or block, anti-aircraft cannons, and the tractor beam to lift up enemy ground-pounders, this colorless removal engine is worth evey mana spent on it. Arena + Combat step: Declare attackers. Before blockers, activate arena, Choosing one of your tapped attacking creatures. 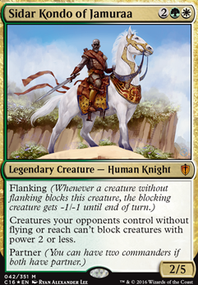 the creature picks a fight before blockers, potentially giving a 2-1 for you if they block afterwards, but otherwise taking out a blocker and still getting all their damage through. Genesis is amazing for recusion, if that's your thing (I know it's mine, but not everyone elses), and it's a 3 drop if you hard cast it with Her fluffiness on the field. Krosan warchief acts like a mini trolls of T-J for beasts, and reduces their cost as well. more a niche card, but worth mentioning if you end up going that route. 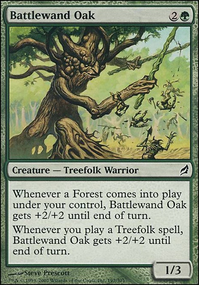 Weatherseed Treefolk is fragile, but returns to hand when killed. Masked Admirers is a card drawing chump blocker. while it doesn't get the cost reduction, it definatly will dish out the damage over a game with trades. and the card draw for ETB is icing on the cake. Ulvenwald Hydra grows based on your land base, and fetches a land as an etb trigger. added bonus: has reach to deal with fliers. 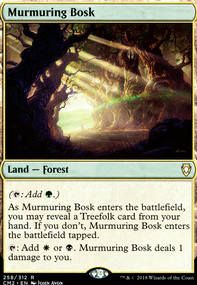 Dungrove Elder is completely worth the G mana cost once you hit 4 lands, and will only get bigger as the game goes on. Terra Stomper , Carnage Tyrant , Chameleon Colossus , Kodama of the North Tree , Kalonian Behemoth , Gaea's Revenge , and Ancient Ooze just do what they normally do with efficiency: smash. they aren't pretty or fancy, but they are cost efficient before your general's discount, so they smash hard for cheap. Hydra Omnivore lets you get damage through defenses of players by ignoring that player entirely and focusing elswhere. 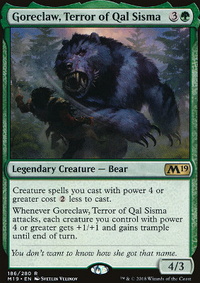 Indrik Stomphowler and Conclave Naturalists might be good replacements for reclaimation sage, with you commander out they cost the same. 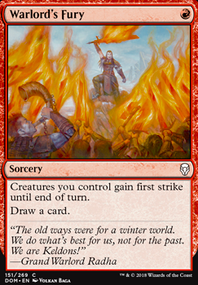 Destructor Dragon acts the same on death, but hits planeswalkers and lands as well. Woodfall Primus is a solid (abet later game) removal that returns to work again. World Breaker acts as an exile, and is colorless to boot. added benefits are reach and recurrable. 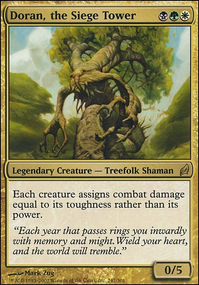 Wickerbough Elder gets the cost reduction, despite being a 3/3 base when cast. Cloudthresher acts a a Squall for 4, with a 7/7 reach attached to it. Wolfbriar Elemental lets you dump green into a token army of 2/2s if you need to spread out the love or create some chump blockers. quantity has it's own quality sometimes. Thornling is a solid all-round stomper that is hard to deal with, via indistructable and increasable toughness. Thrun, the Last Troll is another hard to deal with threat: hexproof, uncounterable, and regenerate means not a whole lot can touch him. Krosan Drover is a good card for the really expensive creatures, giving another cost reduction. Silverglade Elemental is a 4/4 Wood Elves with your general in play. Brooding Saurian is typically just a sideboard card against control matchups, but worth mentioning all the same. Stone-Tongue Basilisk is a cheap ($ wise) little guy that can field-wipe an opponent if you time a swing right. Kamahl, Fist of Krosa should go in every green deck that he can. this goes double for mono-green. Overrun as an repeatable instant? check. wrath countermeasures? Living Plane that only hits opponents for G per land. totally worth it. Heartless Summoning might actually be pretty good, I might try it out. I ran Behind the Scenes originally and it didn't do that much for me unfortunately. I'm trying to avoid defenders, so probably no Tree of Perdition or Tree of Redemption, but I've been considering them. Originally I was trying to run as few creatures with power greater than two, which is why there is no Ulvenwald Observer. I have been going away from that a bit, so maybe. I think it my be worth trying out a Heartless Summoning since almost all of your creatures have big booties. This will interfere with 4-5 of the 1/1 creatures you have in there but those could always be replaced for more creatures that follow your theme, and any ramp you lose from those 1/1s can become sorcery spells instead like Rampant Growth, or even Yavimaya Elder cause it has benefits going to the graveyard. Behind the Scenes can give all your creatures Skulk. And if you put in Heartless Summoning you can then justify putting in Mirari's Wake for the mana boost and that additional +1+1 pump. Other suggestions: Tree of Perdition, Tree of Redemption, Ulvenwald Observer. Feel free to check out my Doran deck for some other possibilities. I will say that my deck isn't totally true to his ability because I've had to build it to my meta (my deck has lots and lots of target removal and wipes) because my meta constantly targets Doran when I play him. MurrSheep Slagwurm Armor is a good card but it's a bit slow due its "cost of 4 mana". I don't see it in my list, sorry. But thank you for mentioning it! ClockworkSwordfish Thank you for suggesting a lot of cards! Austere Command and Slaughter the Strong wouldn't work too well in my meta, beacause I play a lot against token decks which usually consits of creatures from 1/1 to 3/3. I am however looking for a spot to add Dusk! Ensnaring Bridge looks like the best of the four you mentioned. I'll try to get my hands on one and test it for sure. Abzan Beastmaster and Ulvenwald Observer are very interesting together with the suggestions InfinityMinusOne amde. Could be coupled with blink and a Laboratory Maniac combo. As I said earlier, I'll have some more games today and after that I'll decide in which way to go with the deck. Atleast I will try the other method! You are somewhat right about Spidersilk Armor and I should get one. Whereas Shield Wall is more like a "wincon" Spidersilk Armor would give a boost the whole time. Ensouled Scimitar is too expensive for me for 5 mana. Also it can't attack with its toughness like the other creatures because it doesn't have defender. It would sadly stay a 1/5 with flying. Looking good! If you wanted some more (mostly) one-sided board wipes, you could consider Austere Command, Dusk and Slaughter the Strong. You can even deal with larger creatures on a somewhat permanent basis via Meekstone, Noetic Scales or Marble Titan. 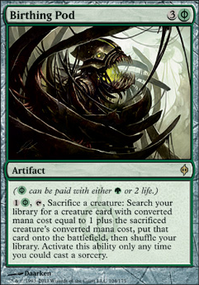 Ensnaring Bridge is probably the best at what it does, but it's hella expensive. You could also get some more card draw from Abzan Beastmaster and/or Ulvenwald Observer, in case Arcades wasn't always enough. Reveillark would also be interesting since it can bring back basically any two creatures in the deck! And by the way, are you sure Shield Wall is good enough? You might get more use, certainly in the long run, with Spidersilk Armor or even Ensouled Scimitar, which can increase a creature's damage capability by 5 or functionally be a 5/5 flyer itself!